If you are looking for a unique date night in Mason you have to try Pitrelli’s Italian Ristoranté. Wednesday Nights are their Couple’s Nights, which include two entrées and a bottle of wine for less than $50! 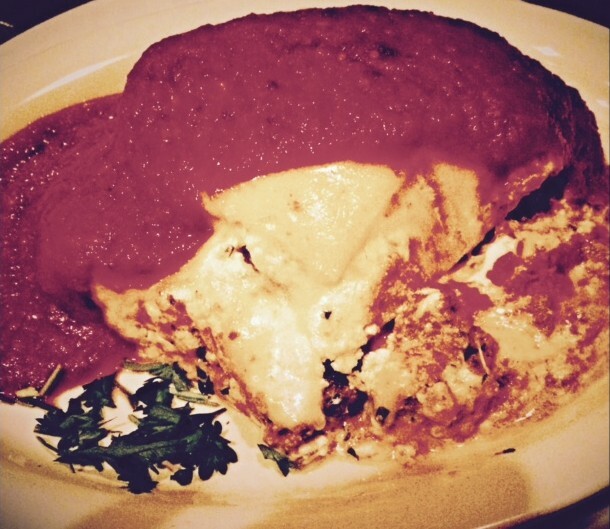 Pitrelli’s is located off the beaten path in the historic part of Mason. They provide a true mom-and-pop Italian dining experience. 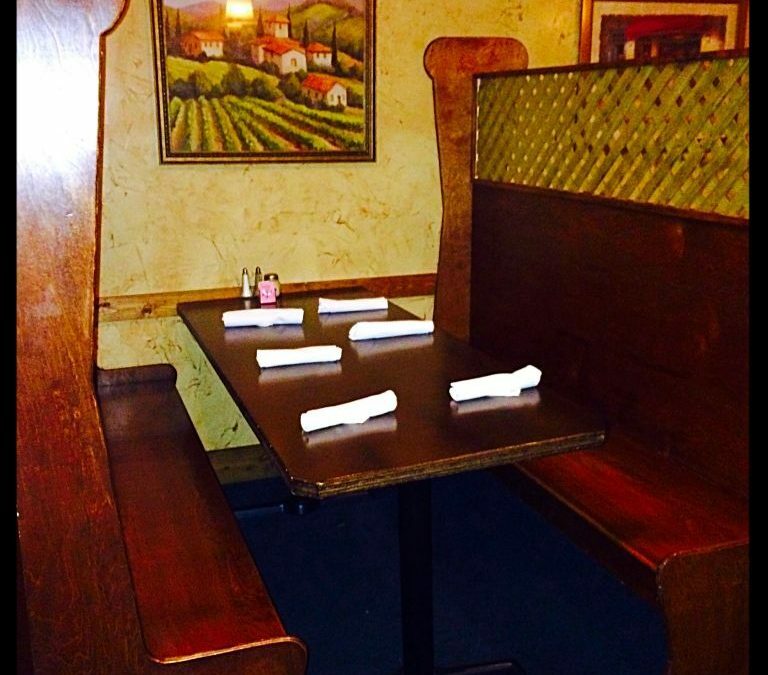 When we walked in we were warmly greeted and sat promptly in a large, but cozy booth. The ambiance was romantic — dimly lit with Italian-style decor, bottles of wine, vines, etc. Walking into this restaurant is like walking onto the set of Cheers (a popular TV show from the 1980’s) where everyone knows your name! The manager, Lynnette came over right away and greeted us! By the time we left, we were on a first-name basis. We noticed she knew almost all of the other couples’ first names too. That gave me such a warm and welcoming feeling, it truly felt like home. Kari, our server was extremely fast, friendly and knowledgeable. The bartender, was a handsome Italian man; he was super friendly — joking and talking with us and the other customers seated at the bar. 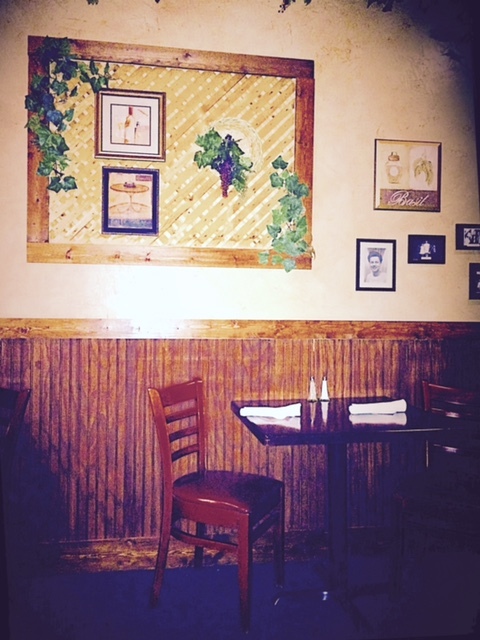 This is a quaint restaurant with three comfortable dining rooms that give the feel of the Pitrelli’s family room. The owners, Jim & Linda, are a husband-and-wife team of retired St. Susanna teachers! Pitrelli’s was an afterthought to a successful catering business, and to the family’s popular bottled marinara sauce. The restaurant serves only authentic Italian cuisine. My husband, Scott, started off with a beer, and I went with the most delicious Red Sangria! 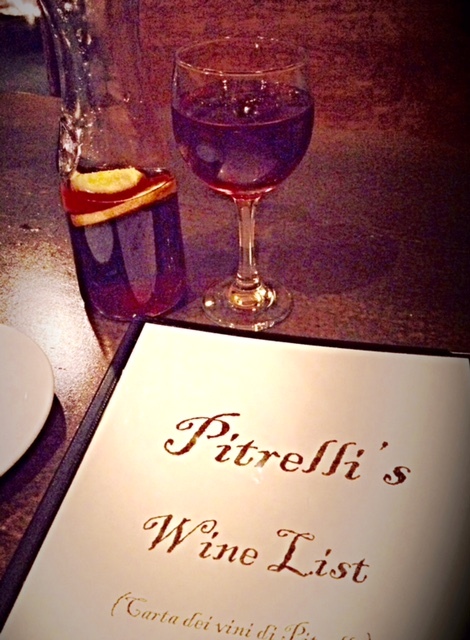 Since it was our first time visiting Pitrelli’s, we wanted to try a little bit of everything and we did just that! Scott and I chose (with Kari’s help) the Homemade Bruschetta Pizza for a starter – tomato bruschetta with capers, spicy olives, fresh basil, garlic, olive oil and Romano cheese served on Italian herb flatbread. We both got salads too; I chose the Caesar Salad, and it was amazing! 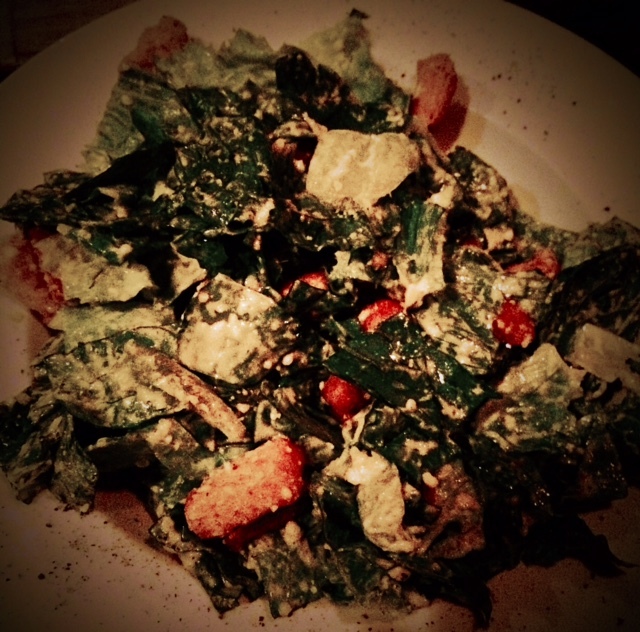 Scott chose the house salad – chopped romaine topped with red onions, tomatoes, seasoned croutons and Romano cheese served with his choice of dressing. He went with their creamy garlic vinaigrette. Kari also brought us some homemade focaccia bread with specialty garlic butter to enjoy with our salads — definitely a nice touch! 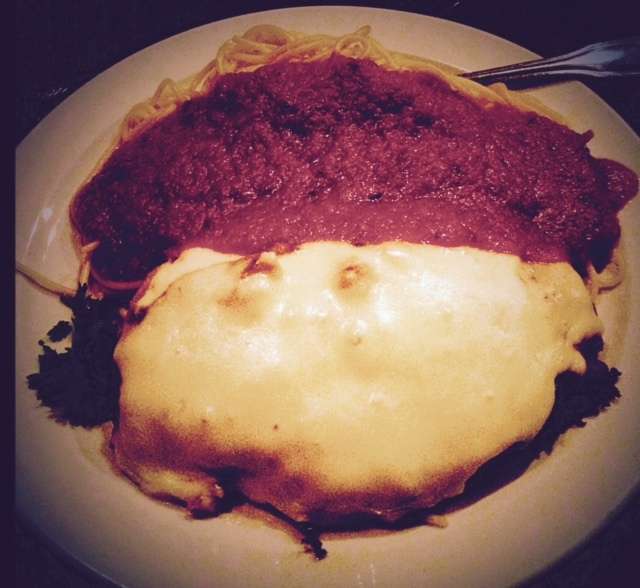 Next were our entrées, Scott chose a house special, their Chicken Parmesan – breaded and sautéed chicken breast topped with Mozzarella and Provolone cheeses served over a bed of pasta with a basil and garlic marinara sauce. And let me just say, he LOVED it! Lasagna is my favorite food! So of course I had to try their Lasagna Bolognese, which is also one of their house specials. A traditional hearty meat sauce layered with pasta and herbed Ricotta — it was OUT OF THIS WORLD! I love their sauce! Of course we had to try a dessert from their in-house bakery, Auntie Mimi’s! Jim and Linda’s daughter, Kimie bakes the desserts fresh every day! Kari brought us a Chocolate Chip Cannoli and a piece of Chocolate Cheesecake with a brownie crust and raspberry sauce. They were both WONDERFUL! 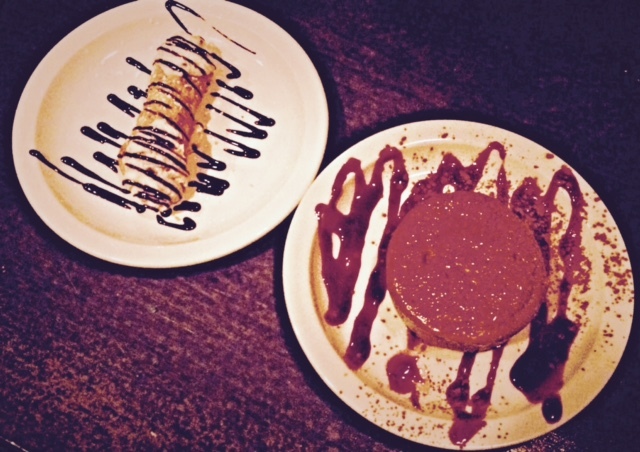 Your choice of two entrées from the pasta section of the menu. There’s More…. they have WINE TASTINGS! There was also a wine tasting going on the night we went, and we were invited to check it out! 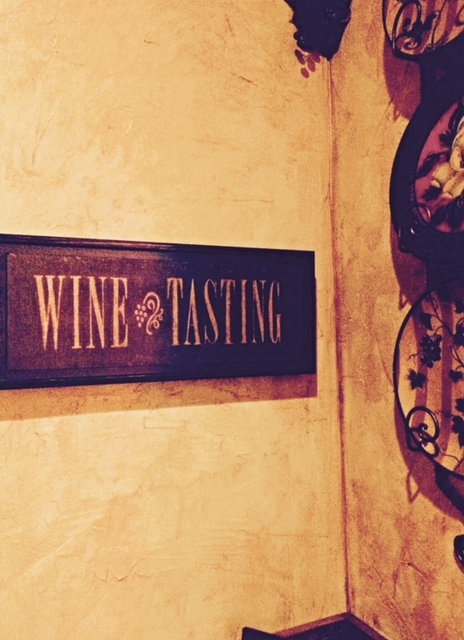 It looked like everyone was having a great time in the private tasting room with wines and appetizers! I would love to do this with a group of girl friends! 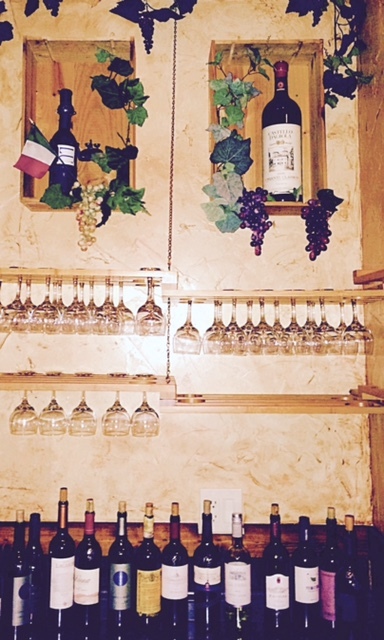 Their wine tastings are structured around the wines they serve at Pitrelli’s. After their tastings, they offer the featured wines at a reasonable price so you can bring them home your favorites to share and enjoy. They are very proud of their list and prices.